Toon Beerten sent us this wonderful DIY mood lamp. On this page i will explain how i created my own colour changing lamp with red, green and blue leds that fades between all colours of the rainbow. It really comes out well at night when other light are dimmed. In daylight conditions the colors aren’t noticed well. Although it’s low budget i must say the result is nice. P.O. got so excited by all the responses from the TicTac flashlight project that he sent us another of his creations. 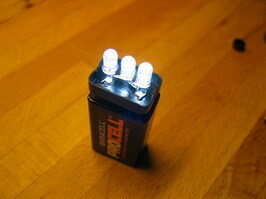 This time it’s a LED lamp created from the scraps of an old 9v battery and three LED’s. No need to use a resistor here as he’s used three 3.5v LED’s which adds up to a required voltage of 10.5v… which the battery can’t supply. The benefit of this is that you don’t have any losses in a resistor and the battery will end up lasting longer – but the LED’s will not operate on 100%. Take it or leave it, this is a great project that involves few components and has a compact and robust design. P.O. 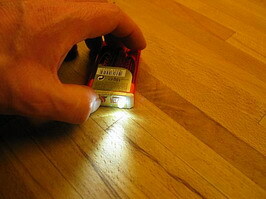 sent us this how-to on building a very handy flashlight out of a old TicTac mint box. It consists of a empty TicTac box (duh! ), three batteries (that fits perfect), a small switch, a resistor and a bright LED. Go to the TicTac flashlight page. Leah Buechley (on the picture) has got it right!! She combined programming, with soldering and sewing! Now that’s what diy is all about. 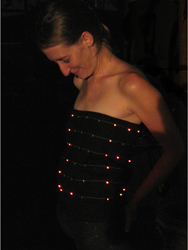 In a 7 page article she will show you from a-z how she put together a ‘wearable led display’, perfect for club hopping! ( Or maybe… NOT! ) The purpose of the whole display is to show off the ‘Game of life’ which is a mathematical simulation of life. You can read more about the game of life here. The project contains a lot of good close ups on her work in progress, and even a short movie where you can see the simulation running. I only wished that she would dance a bit at the same time. But for now – read about her project in it’s full glory! !